One of the current activities of the Layers of London project is to explore the local partnerships that can be created to bring together a community of people who can test the Layers website as it develops and then start adding content in the form of images, film- and sound-clips, text and links. These user-led projects will help demonstrate the website’s full potential and encourage others to contribute their own material. Our initial search in Barking revealed that there is a very strong sense of identity in the borough, which is excellent, as there is nothing like local enthusiasm and interest to lead to the development of successful heritage projects. So far, we have found that all of those we have contacted are interesting in getting involved, or at least supporting the project going ahead. DABD UK, a Barking-based charity that works with socially-excluded people around the UK, and which has a collection of photos chronicling its first 50 years that it would very much like to digitise and make publically accessible. It also has the volunteers that can do this, some of whom would learn new IT skills in doing so. Eastbury Manor House, a Grade I 16th century country estate, today surrounded by interwar residential development, which is currently embarking on a project to record oral histories from volunteers who have worked in the house over the past few decades. Layers of London appears to be an ideal place to make these accounts available and accessible to the widest possible audience. The Catholic Diocese of Brentwood (which includes Barking), which has an excellent archive that includes invaluable accounts of East London during the war. Layers can be used to raise the profile of this well-managed collection and draw attention to valuable unpublished material it contains. 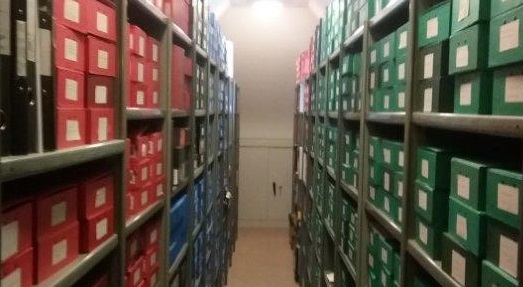 View of the archive of the Catholic Diocese of Brentwood, a valuable source of information about the modern history of Barking and Dagenham. Another advantage of Layers is that it can serve as a platform that significantly prolongs the lifespan of other heritage projects. For example, Barking’s Studio 3 Arts is leading a project called Open Estate which documents the memories of residents of the Gascoigne Estate – home to around 7000 people and currently subject to demolition and redevelopment. It is the intention that by the end of September, when Open Estate draws to close, material capturing the memories and experiences of Gascoigne residents can be accessibly preserved through the Layers website, perhaps helping to preserve some elements of community identity in virtual form. Potential projects with Eastside Community Heritage, a leading community heritage organisation, St Margaret's, the church in the grounds of Barking Abbey, one of the borough’s most important historic sites, and the local archive, are all examples of other local links being pursued. In parallel, thanks to Historic England’s Heritage Schools Programme, we have established links with a number of local schools that are interested in getting involved in the georeferencing process, either as part of their formal learning programme, or as an extra-curricular activity. To date, these schools include Eastbury Community School, Eastbrook School, Southwood Primary, Riverside, Becontree Primary, James Cambell Primary, All Saints Catholic School, and Gascoigne Primary. The number of individuals expressing an interest in volunteering, and our links to a wide network of groups outside the borough are increasing. We eagerly await the completion of the prototype website to take things further forward.